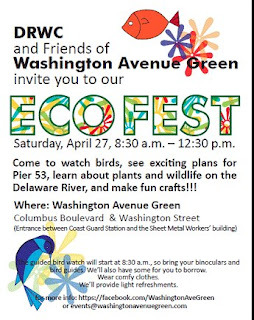 EcoFest will be held this Saturday, April 27th from 8am to 12pm at Washington Avenue Green. Trust me, if you have any interest in the future of the Delaware River as it pertains to Pennsport, you're going to want to be in attendance. 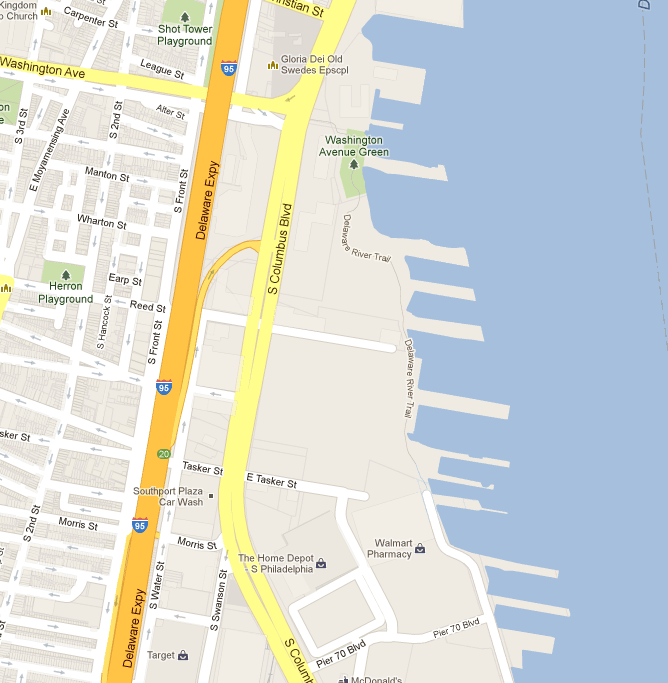 As PlanPhilly announced today, the plans to transform Pier 53 (Washington Avenue Green) will be unveiled during the festivities at EcoFest. It's anticipated the plans will look to fuse the current landscape with the ability to "touch the water" as well its rich history of immigration, being known as the "Ellis Island of Philadelphia." This is exciting news all around. However, the plan doesn't end with Washington Avenue Green. It's just the beginning. Joe Forkin, Vice President of Operations and Development of the Delaware River Waterfront Corporation (DRWC), foreshadowed this project at the Pennsport Civic General Membership Meeting on April 10th. One of the main elements he was excited about was the accessibility to the water as well as the wetlands that have developed along this stretch of the river down to Pier 70 - which is the beginnings of looking towards a native wildlife/vegetation focused river trail. If realized, this would potentially give Pennsport the go-to spot for water recreation and enjoyment along the Delaware River. Dare I say, it could provide a more Schuylkill River-like experience. Forkin explained that the DRWC is actively looking to acquire the piers stretching from Washington Avenue at Pier 53 down to Pier 70 around the Walmart area - with Piers 68 and 70 already acquired. This would allow for the DRWC to create a substantial trail that incorporated the wetlands as well as the ecosystem that is already in place. Pier 68 is a cornerstone to this future project as it has been deemed structurally solid out to about 350 ft - meaning more access to the river. It would be the bookend to Washington Avenue Green. While the DRWC is still readying a grant to repair Pier 68 - they're still figuring out the best use for it. 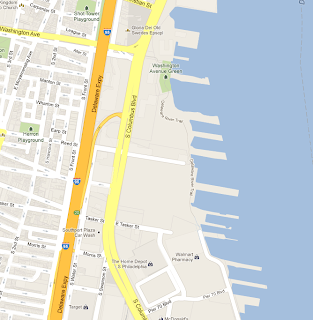 Much like Washington Avenue Green, the hope is to design Pier 68 with the ecosystem and wetlands in mind. So no, it won't be Race St. Pier v2.0. Instead, there has been some ideas to use it for what it is currently (albeit illegally) being used for now - a partial fishing station and a tug boat dock. That's certainly not set in stone but gives you an indication that the DRWC is serious about maintaining the current environment as well as listening to suggestions for the future development of Delaware River. Much like with the project at Race Street Pier - development of connector streets for ease of access via the neighborhood is also in the planning phase. The streets being targeted are Washington Avenue, Reed/Dickinson St, and Tasker Street. An interesting tidbit was the mention of Swanson Street becoming a possible North/South connector street for the West to East running McKean Street. 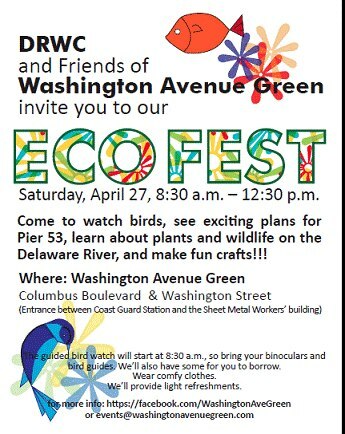 In short - you're going to want to hit up EcoFest on Saturday. This unveiling is exciting for Pennsport as well as the Delaware River. The future realization of this trail could give the people of Pennsport (and Philadelphia) direct access to the Delaware River in an environment true to its beautiful surroundings. تنصح كل الجهات المتخصصة لتطهير مياه الشرب ووزارات الصحة الدولية بغسيل خزانات المياه المخصصة بالشرب مرة كل ثلاثين يوم وتعقيم خزانات المياه باستعمال المطهرات التي تتركب من سيارات الكلور الترتيب بجرعات مناسبة لمساحة الخزان لفترة ليست أقل من ثلاث ساعات. New Development in "No Man's Land"
Yo Pennsport, L&I Needs Your Number!